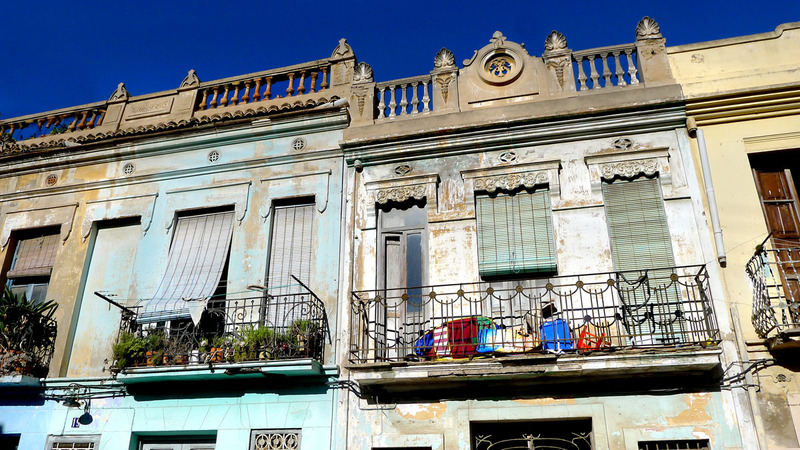 A bright blue sky has me on my bike, tootling around Valencia, taking side streets as they come, no direction known. 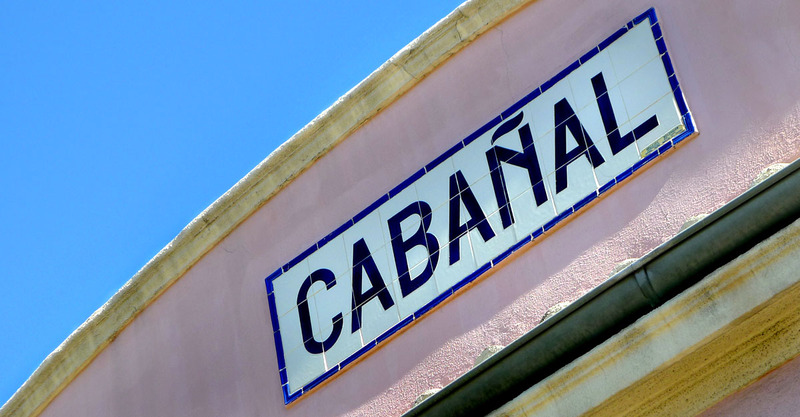 Eventually I arrive at Cabañal market, a few streets short of the sea. When I was last the market, about five years ago, it was on the verge of closing, and I seem to remember that it closed for a period because of the lack of custom. Obviously something happened because now it is a perfect example of the bustling Saturday food market. 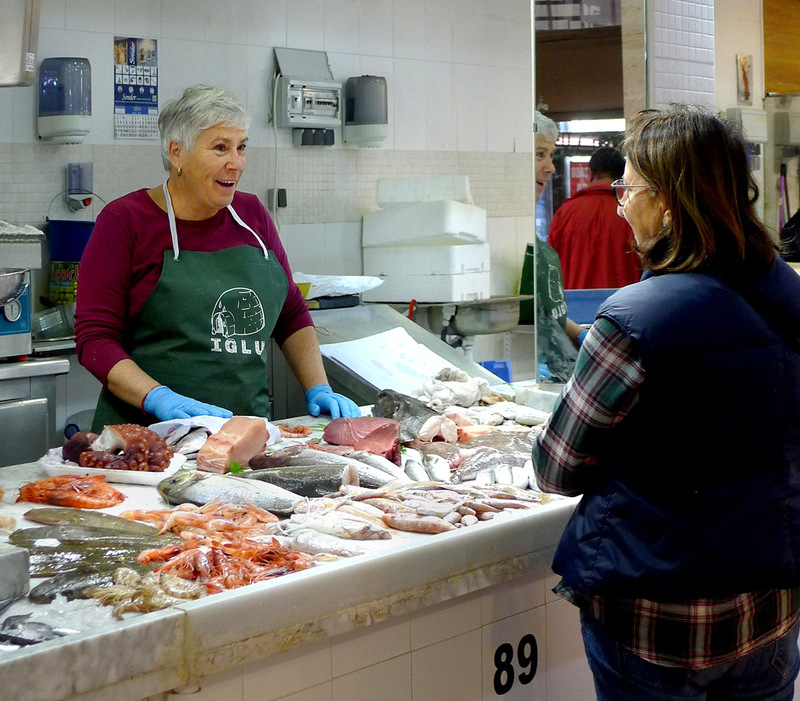 There’s nothing here I can’t buy from Ruzafa market, only a three-minute walk from my home, other than horse meat, although I wasn’t tempted by the quality of produce on display at the Carne de Caballos stall as much as the smile of the spikey-blonde-haired lady who runs it. But I enjoy walking these places, watching shoppers making their selection, listening to the banter of the stall-holders, which, in the Central Market is more likely to be raised voices telling tourists not to take photos. I get tempted by the bocadillos at El Marcado bar and cafeteria. Market bars are the perfect place for the solitary diner. In a restaurant the concentration is on the dining experience itself. You sit at a table for either two or more and the waiter removes the cutlery, napkins and glasses of your non-existent dining companions, emphasising that you are a solitary soul. As a once-upon-a-time restaurant reviewer I’m quite used to eating alone, and devoid of any shame I’d simply take out my notepad and write as I worked my way through the meal. I’ve eaten is some superb restaurants, but usually only in the company of a pen and paper – I’d much rather eat the most basic menu del día in the company of a friend, although these days my companion a table is usually a book. But at a market bar the food is simply an addition to the action. Shoppers and market people come and go, the act of eating is an on-the-move affair, which is why I’ve always liked them. But I’m not the only one tempted by El Mercado, because all the stools at the aluminium bar are taken. I make another circuit of the market, but still no room at the inn, so I wander out into the square. 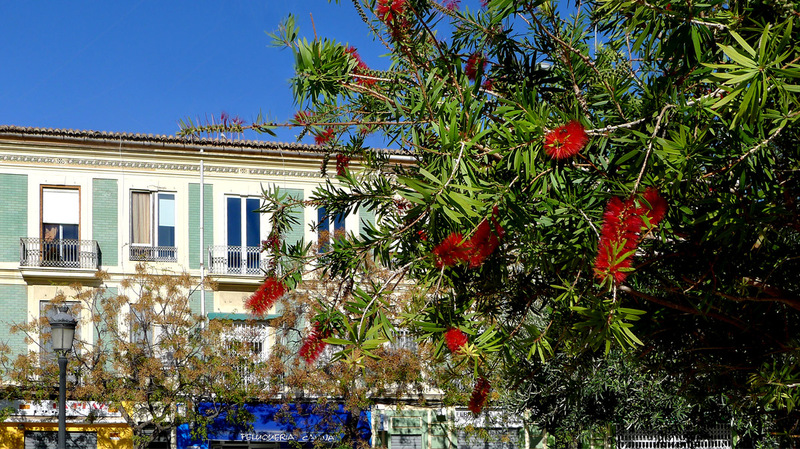 Apart from a few modern architectural excresences and bland facades, a good percentage of the buildings around the square are late Modernista, two-storeys above shops, with attractive pale green glazed tiling and cast iron balconies. In the paved and planted garden in the centre, where a slight breeze wafts the deep red flowers of the euphorbia, there’s an air of peacefulness. For decades Valencia Town Hall, led by the formidable wicked witch, Mayoress Rita Barberá, has being trying to hack a swathe through the area, and with its usual monstrous conceit has just announced seven hundred thousand euros in the budget for 2015 to buy properties in Cabañal for demolition for the proposed extension of Avenida Blasco Ibañez, despite the national government and European Courts finding against her plan on the grounds of the architectural and historic importance of the area. She has dumped generations of problem families in Cabañal, refused locals planning licenses for repairs, bricked up perfectly liveable houses and demolished others overnight amid the fury of public opinion. 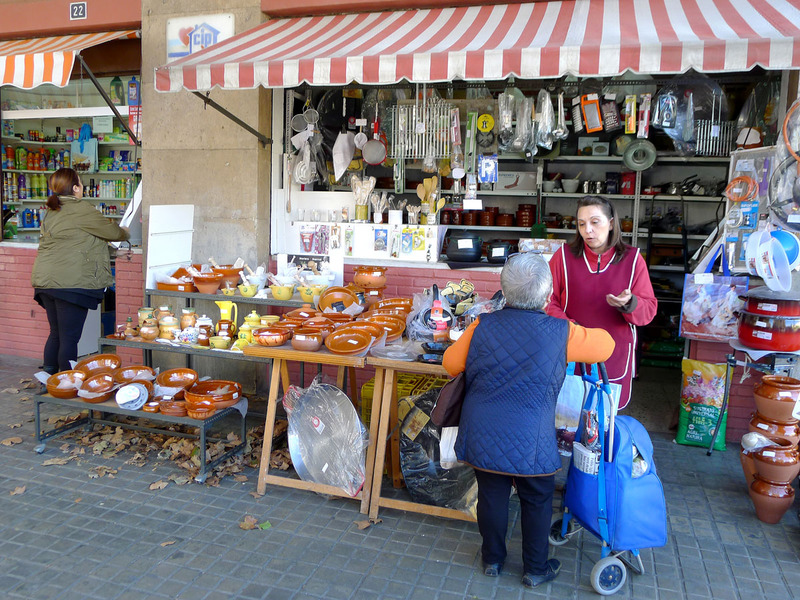 The square on which the market is built is one street away from the route of the proposed extension, which was planned to begin at Calle Millars and move north. 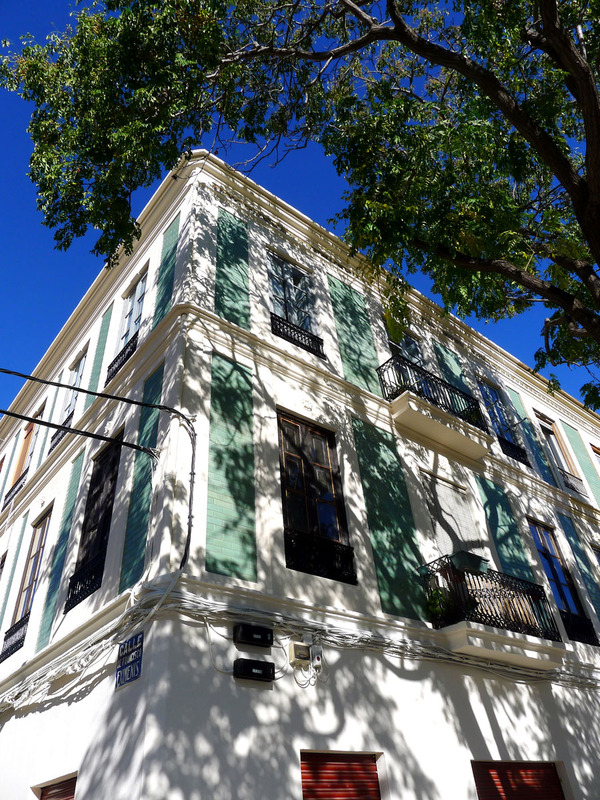 On Calle Francesc Eixments, one of the narrow streets that cross Millars, are some perfect examples of two-storey Modernista houses where families have lavished their money and their love; not the exquisite tiles and floribunda plaster of some of the grander houses but a compact homeliness as suited the fishing community that lived there. On most streets the same pattern is repeated; bricked up and derelict cheek-by-jowl with lovingly cared for. The corrupt burghers of the city need look no further than Villajoyosa, a couple of hours south, to see where derelict streets and crumbling houses were turned into an attractive casco histórico, although rumour has it that there are ‘understandings’ that have to be accounted for as regards the block-headed refusal of the council to give up their single-minded rampage to get Blasco Ibañez connected to the prom. Given the back pocket filling of a number of senior politicians of the governing party, there might well be an element of truth in the rumour. Her companion, obviously an estate agent, hears my questions and quickly ends his call, telling the lady that it will never happen, and besides, even if it did, the planned route has moved to the next junction, one hundred metres further north. Indeed, he added, it would be better for her because the area would be opened up and she could appreciate the new gardens that would be laid. Although I’m not sure how much that would compensate for the noise of the dual-carriageway, three lanes either side, that would be a hop-skip-and-barely-a-jump from her front door. I wander back to the market and find a vacant seat at the bar of El Mercado. 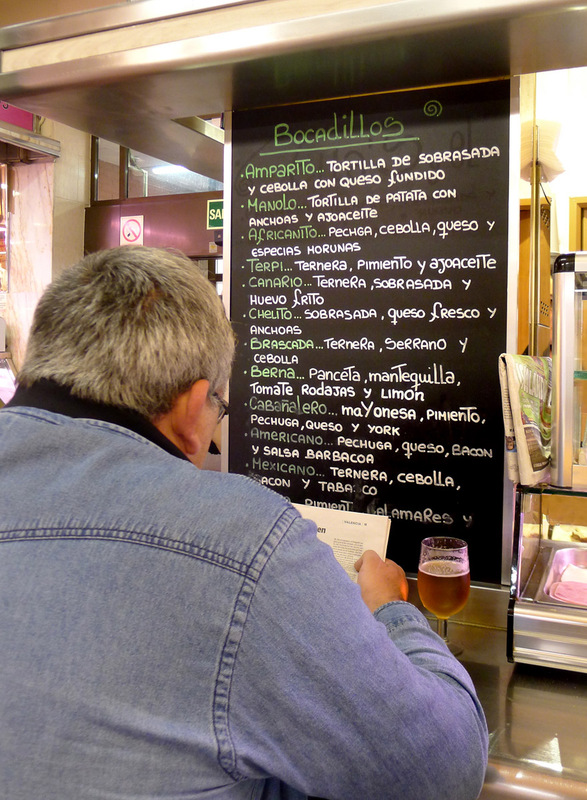 The list of bocadillos is a fine one; Brascada – ternera, jamon y cebolla; Canario – sobrasada, queso fresco y anchoas; Mexicana confuses me, with its ternera, cebolla, bacon y tobaco, until I realise that someone has rubbed the ‘s’ out of tabasco. I settle for Americana – pechuga, queso, bacon y salsa barbacoa, with a small bowl of bitter olives and a bitingly cold sparkling water. While I eat, the market winds down. A stall holder from in front of the bar orders a gin and tonic, the bath-size version that used to be the norm until bars began adding an extra ice cube to the glass to disguise the smaller measures. He saunters between his glass and his stall as he packs away heads of lettuce, boxes of onions, nets of oranges and sacks of potatoes. Lacking a sofa to siesta on, I sit on a bench in the park opposite the entrance to the market in the surprisingly warm mid-November sun. I take out my book to get lost in the skulduggery of 18th-century London, and slowly my eyes close. Read more about Spain at Spain Uncovered. You are currently browsing the Valpaparazzi's Blog blog archives for November, 2014.